Thanks to my colleagues at St. Columba’s College English department for the idea. After putting in quite a bit of work into Young Scientist Projects for the first time this year, we have had four out of the eight submitted accepted for presentation next January. Busy times ahead. They’re almost all in Second Year, and when we spend time on it in class, those not preparing for the Young Scientist Exhibition will be preparing for the Scifest equivalent next May. Then I got a phonecall on Saturday from Aoife O’Donoghue, who is the Tyndall Outreach Officer, to inform me that one of my leaving cert students won first prize in the senior category of Science Snaps, their Science Photography competition (Shhh . . . Shane doesn’t know yet). Not that I that anything to do with it mind; I tried to promote an internal Science-Photo competition at the beginning of the year and had the grand total of three entries. So at least this should help in promoting it if it runs again next year. And Mary Mulvihill over at Science@Culture might even be impressed with the quality of the entries. And then I came across this on Youtube, and I don’t know why but I cried. My wife thinks it might have been the beautiful music in the background. I put together a list of (124) possible Young Scientist projects for my second-year class. Most of them are taken from previous years and hopefully it will give them some ideas. Closing date is October so you need to get cracking. You don’t need to have the project finished by then, but you will need to have a one-page description ready to send off. Remember only about half of the applications are accepted for presentation. The good news is that we will be concentrating on this over the next two weeks, so no boring science textbooks. I pushed this with fourth years before but got nothing but frustration for my troubles. So this year I was going to concentrate on second-years, but some of my fourth-years have actually come up with some very interesting ideas. Hold this page. The list of projects is here. The Young Scientist homepage with rules is here. 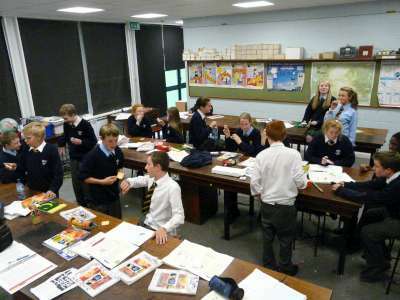 Some of my science class investigating the action of saliva by trying to eat three crackers in under a minute – is there a science project here? I mentioned that I was trying to promote Scifest as a means of getting students to do real science as opposed to the learning by rote and following cookbook recipe-type so-called experiments. So after promoting it among second, fourth and fifth years, I ended up with about eight groups, of which seven pulled out when they realised the presentation was going to be held on a non-school day. 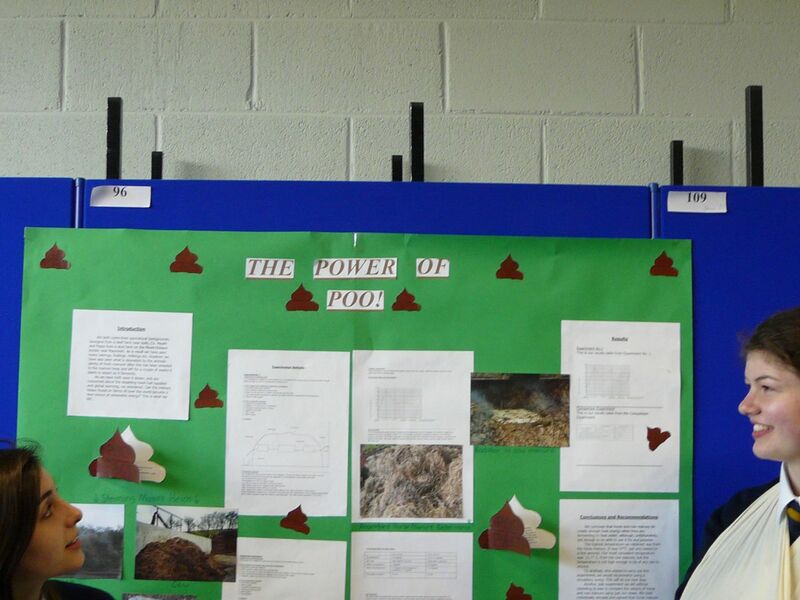 Which left us with ‘The Power of Poo’, a second-year entry from two girls; Georgina Gilsenan and Philippa Tuthill. This highly original project involved inserting a couple of radiators into the middle of a dung-heap, pumping water through the pipes, and noting the rise in temperature. The results obtained may not turn the planet off its axis, but there was a serious amount of science involved in controlling variables. They even tried two different dung-heaps; cow and horse! Runner-up in Best overall Project. Unfortuantely I had to leave early in the afternoon and so wasn’t there for the prize-giving ceremony, and so don’t have any photos of the girls receiving their prizes, but if I talk nicely to their parents they might lend me some to put up here. The irony is that after prodding and poking each of the other groups all along the way, only for them all to pull out, this was the one project which I had almost nothing to do with apart from submitting the entry. There really shouldn’t be any teacher’s name associated with it – it really was all there own work. Not that it will stop me shamelessy exploiting the publicity in school as a means of promoting the project again next year, with hopefully a little more commitment. You would still have to use their software and sensors, but still . . .?? How much energy is saved by switching appliances onto ‘Standby Mode’? An Energy-Meter is available for this. Can girls really multi-task better than boys? If any of these grab your fancy let me know! Here’s another nice idea for generating electricity; ideal for Scifest or Young Scientist project if only to investigate its feasability. “The students’ test case . . . was a prototype stool that exploits the passive act of sitting to generate power. The weight of the body on the seat causes a flywheel to spin, which powers a dynamo that, in turn, lights four LEDs. “People tended to be delighted by sitting on the stool and would get up and down repeatedly,” recalls Graham. I was talking recently about setting up a group blog for students doing Scifest 2008. Tom has set up two of these in his own school: http://msmccarthy.21classes.com/ and http://crazy.21classes.com/. All of these are involved with CESI, which is holding its conference on Friday 8th and Saturday 9th February, so maybe I’ll delay things a little and hopefully talk to them there.